Sushi is a Japanese speciality comprised of vinegared rice and either a topping or filling, usually raw fish or vegetables such as cucumber. 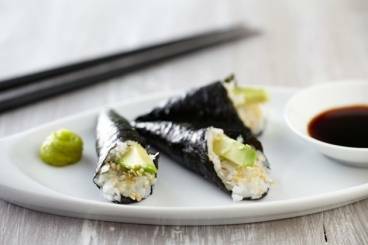 Our recipe for perfectly cooked sushi rice seasoned with rice wine vinegar, sugar and salt. An ideal base for all of your sushi recipes. It takes years to master the art of making Sushi but we will show you how to make great 'homestyle' sushi, cooking and seasoning the rice, cutting the fish and vegetables to then make Nigiri, Gunkan, Hosomaki and Temaki rolls. Learn to make seasoned sushi rice with a seared yellowfin tuna loin with a poached quail's egg, mizuna leaves and picked shiitake mushrooms. Oval shaped sushi made with pickled salmon, tuna, sea bass and cucumber and topped with caviar. Oval shaped sushi made with pickled salmon and topped with salmon caviar. Home style sushi similar to nigiri. Rice balls topped with a thin slice of super fresh salmon.